↑ 1,0 1,1 1,2 "2015/16 Students by HE provider, level, mode and domicile" (XLSX). Higher Education Statistics Agency. Retrieved 17 February 2017. ↑ "Rebranding FAQs". Goldsmiths, University of London. Archived from original on 25 February 2007. 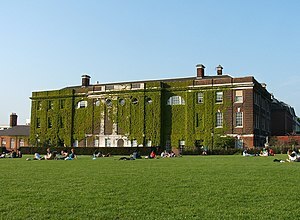 Retrieved 6 March 2007. it is now known as Goldsmiths, University of London. ↑ http://www.aim25.ac.uk/cgi-bin/search2?coll_id=5499&inst_id=29"Goldsmiths' College archives". Aim25.ac.uk. 29 September 1905. Retrieved 26 April 2010. ↑ "Revealed: BBC boss who landed £866k payoff and walked straight into another public-sector job". Daily Mail. London. ↑ "Centre for Cognition, Computation and Culture". Archived from original on 16 May 2011. ↑ Wignall, Alice (18 January 2005). "What it's like to work at... ...Goldsmiths College, University of London". Guardian. Retrieved 24 July 2013. ↑ "Goldsmiths University of London. Tungsten Corporation and Goldsmiths announce artificial intelligence venture". Goldsmiths University of London. April 28, 2015. Retrieved February 15, 2017.